The Broward County Sheriff’s Office released the footage of Jean Pedro Pierre, 42, hitting and dragging Deputy Sean Youngward, 48, at a condominium complex in Lauderdale Lakes on Wednesday, the Miami Herald reported. The department said it released the footage on Friday to quash rumors circulating on social media regarding the shooting. Some social media users accused of officer of executing an unarmed man – but Broward County Sheriff Scott Israel said the video show what actually happened. The deputies were called to the condominium complex regarding a disturbance report, WISHTV reported. 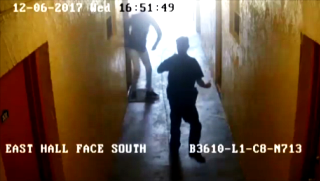 The video showed Pierre chasing Youngward down the hallway of a condominium in Lauderdale Lakes while hitting him. Youngward and Pierre arrive in the front of the building, where the deputy appeared to pull out a weapon and point it at the suspect. Pierre walked toward the cop and punched him, causing him to fall to the ground. While Youngward was on the ground, Pierre hits him and grabbed his legs. The suspect drags Youngward, who attempted to tase and hit him with his baton. Another officer, Deputy Steven Briggs, approached Pierre after being called for backup. Pierre continued to drag Youngward while kicking him. Briggs tried to tase Pierre but was unsuccessful. “Tase him, tase him; don’t shoot him,” someone in the video was heard saying. “Let it go, bro. They’re going to shoot you, man,” another person was heard yelling in the video. Pierre stopped to approach Briggs who shot him three times. The suspect was transported to the hospital, where he died. “Youngward tried to stop the violent attack by deploying his Taser and using his ASP (extending baton). Neither form of less-lethal force stopped Pierre from assaulting him,” the sheriff’s office said in a statement. Both deputies are on leave while shooting is being investigated, as per protocol.